Ovens are not very prevalent in Costa Rica which makes baking a bit of a challenge. Cooking is done on stove tops. 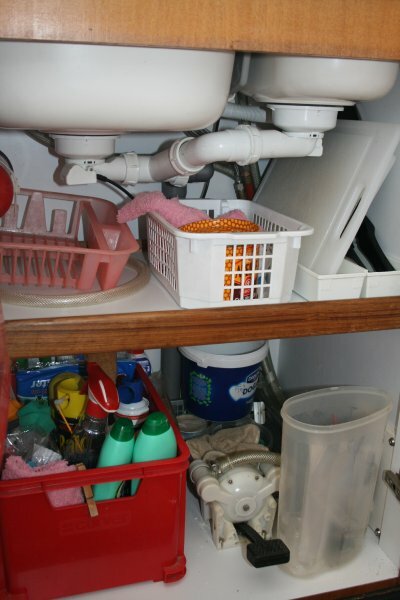 They have cook tops, small refrigerators, microwaves, coffee makers, and blenders. We looked at several apartments and shied away from them because they had no ovens and I love to bake. I had lofty goals of baking for our boat workers each week. All of the apartments at Manuel Antonio Estates have ovens, but they are all a little different. When I asked the two lovely ladies who keep the apartments ship shape how to work the oven, they smiled and said that they don’t bake. They don’t have ovens in their homes. So, why did I need help with the oven, let me explain. Back in America – most ovens have gauges that have temperatures starting around 200 and going up to 550 in increments of 25 degrees. 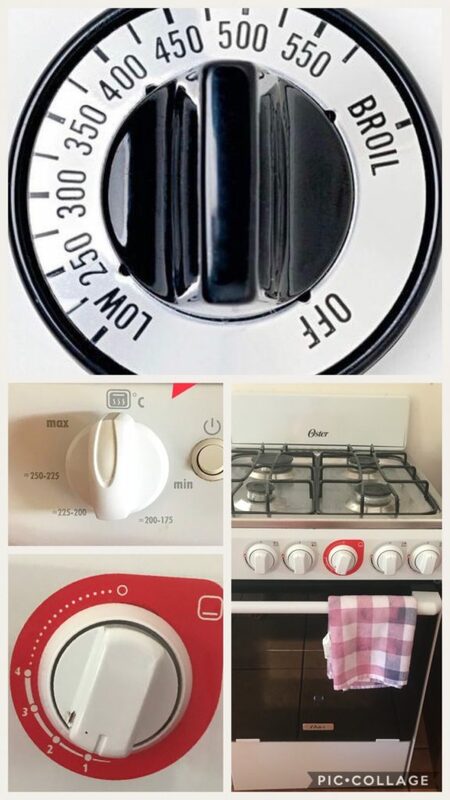 So, if you need your oven at 325 you have a pretty good idea where to set the gauge. And unlike the rest of the world, everything in the States is in Fahrenheit. Here, like other parts of the world, everything uses the metric system and reads in Celsius. Conversion is easy enough to figure out with google. But, then you need to figure out how to read the actual settings. The first apartment we stayed in had 5 settings for the oven. Minimum, 175-200, 200-225, 225-250, and Maximum. It is a wide range when you are trying to figure out 182 Celsius. Our current apartment is a complete mystery. It has 1, 2, 3, 4 and then a bunch of dots…. Image: Top is American Gauge, middle is one gauge here in CR and the bottom left is my current gauge. Luckily, I had an oven temperature gauge from the boat and was able to get the oven within 25 degrees of my desired temperature. What a funny experience. 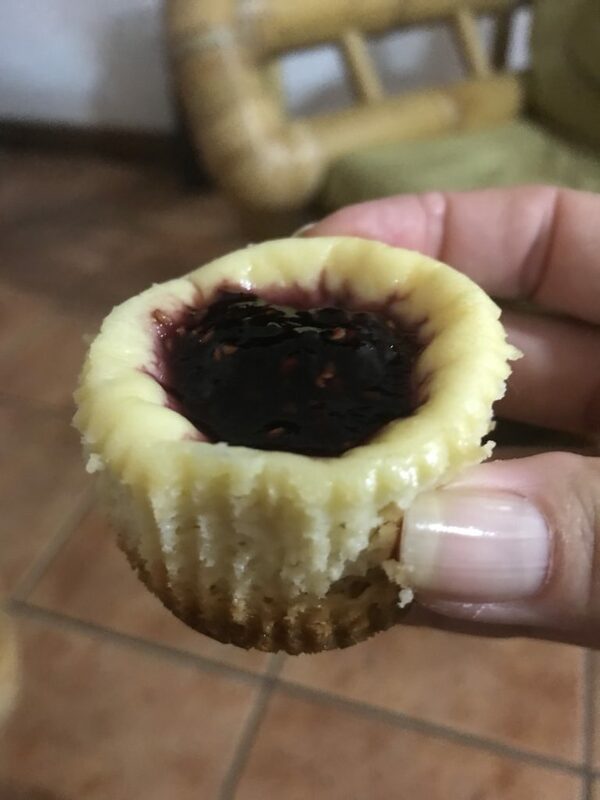 Took nearly all day to bake banana muffins and my mini raspberry cheesecakes (click for the recipe). 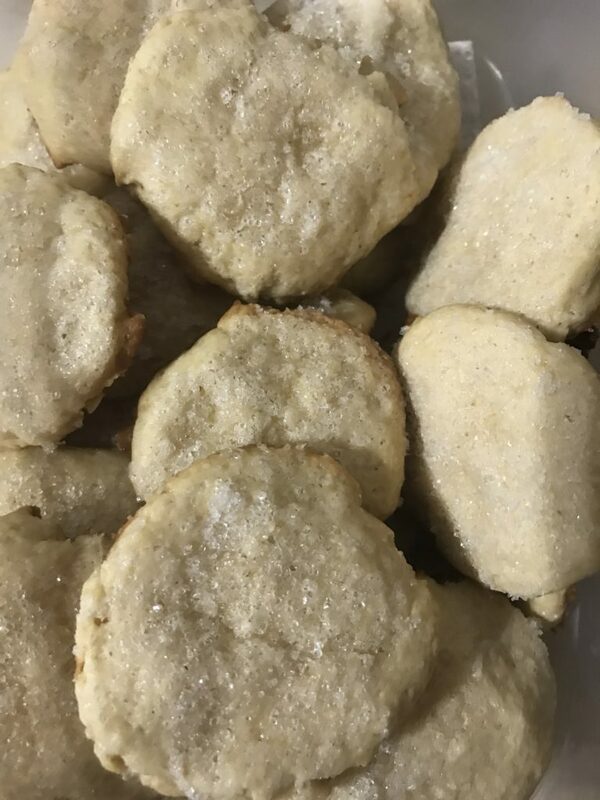 I think I finally got into the baking groove after a few burnt and under cooked batches…luckily you all won’t be subject to eating these baked goods. That was really hard to admit as those who know me know I am an excellent baker. Maybe not a great cook, but certainly a great baker. With our good friend Wayne coming, sugar cookies were a must. Managed to bake several dozen without incident. They just came out small and fat rather than larger and flat. Tasted ok, but not my best. Everything is just a wee bit smaller than back in the States. The fridge will not accommodate a standard pizza box, but it does manage to keep things cold and make ice! 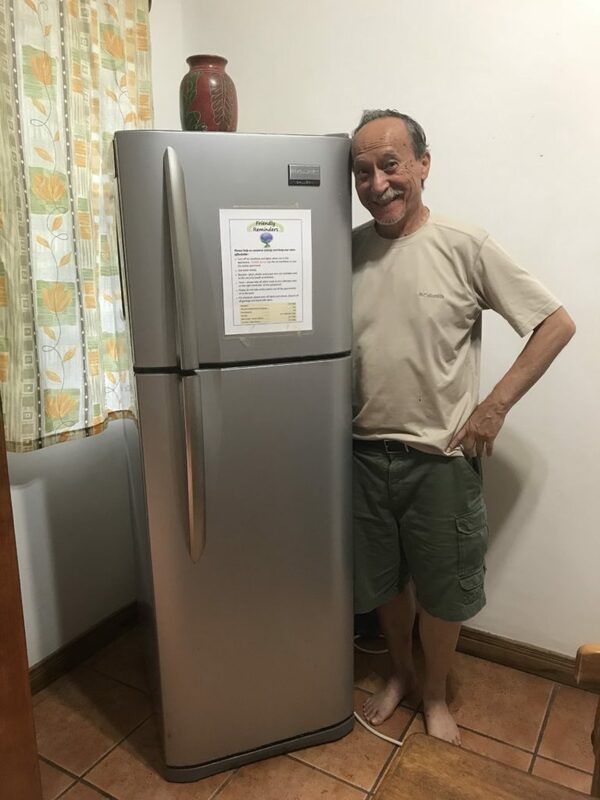 Dad modeling our Frigidare. Our visitors also find it “unusual” or “weird” that when using the bathroom they have to put the toilet paper in the trash can and not the toilet. 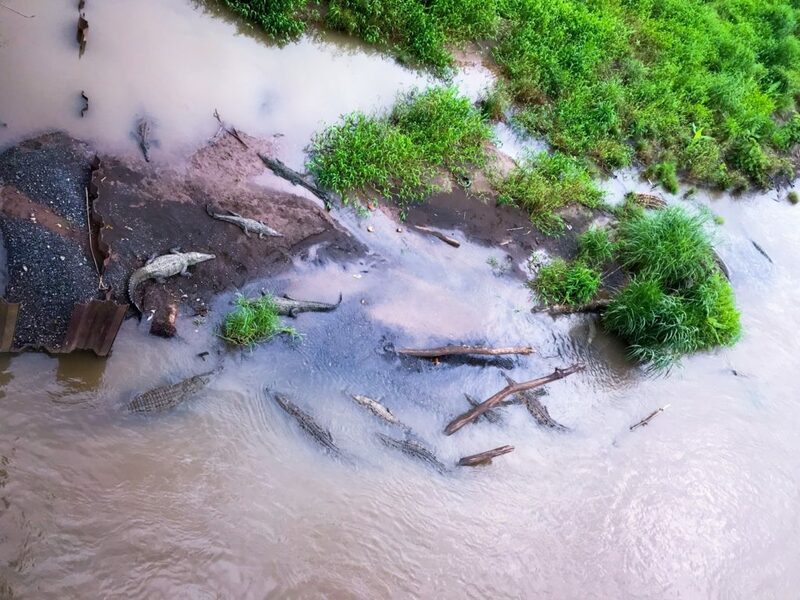 All of Costa Rica is on the septic system. So, restaurants, hotels, public and private bathrooms are like that. 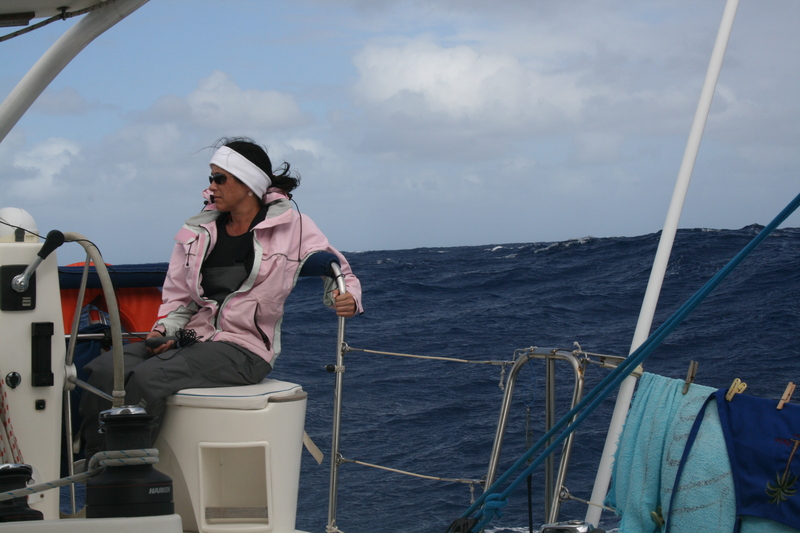 Not a problem for us as we follow the same process on the boat, but our fellow Americans tend to have a hard time. I will spare you the photo of the trash can 🙂 I wonder how many people will read all this way down on the blog. If you did, send me a funny comment. 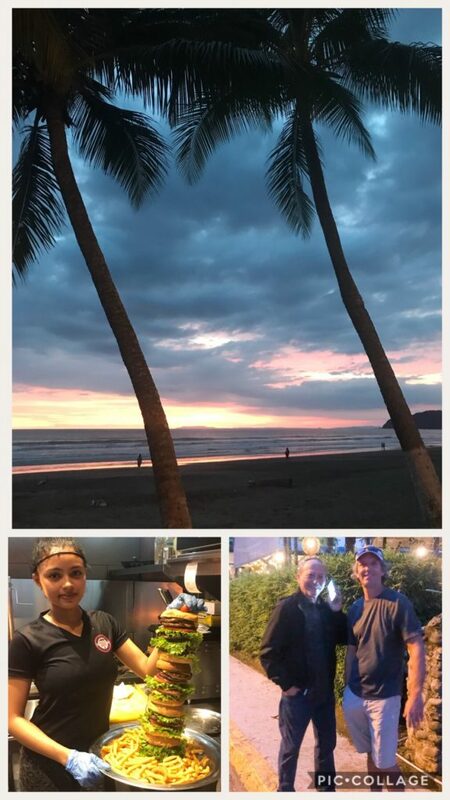 This entry was posted in Costa Rica, nonBoat and tagged baking, cooking, manuel antonio, manuel antonio estates, mini cheesecake, muffins, ovens, Quepos, rasberry cheesecake bites, sugar cookies on September 27, 2018 by Christine. 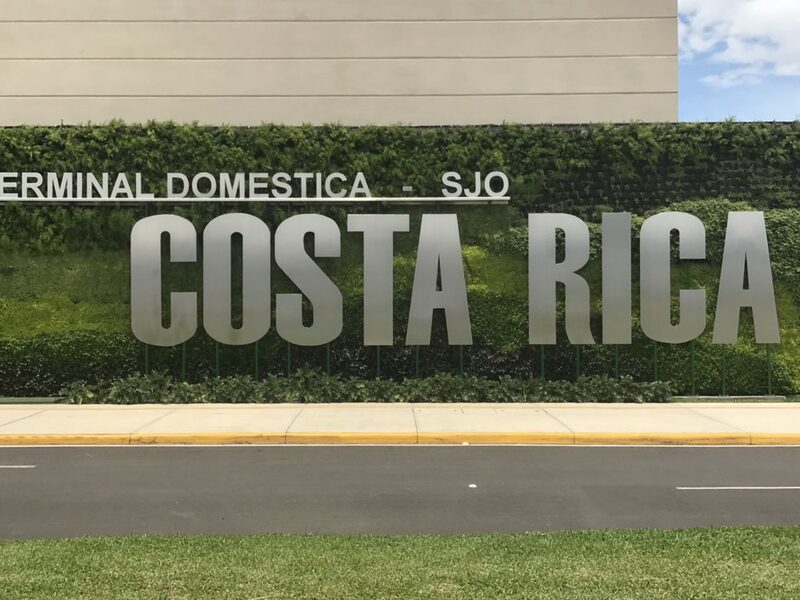 Costa Rica allows U.S. citizens to remain in their country for a 90-day period. We arrived at the end of April so our 90-day period was set to expire at the end of July. 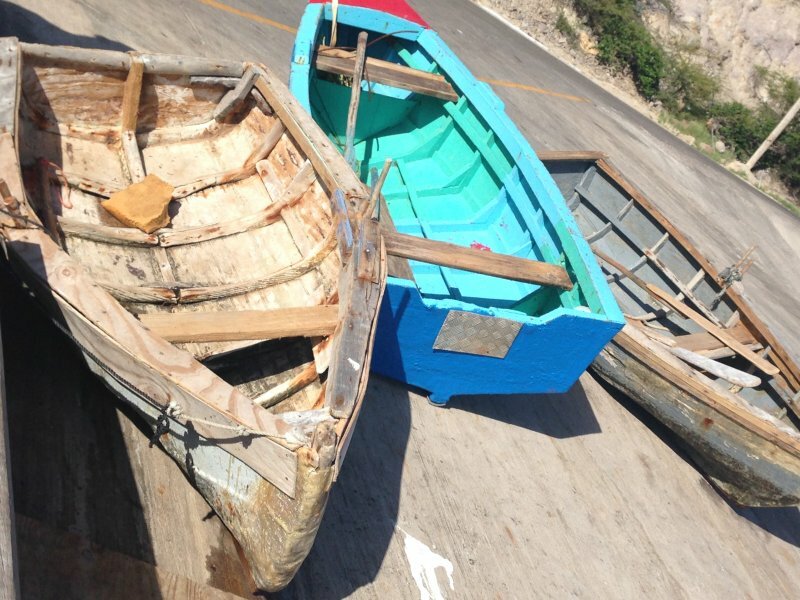 However, by mid-July the repairs on our boat had not commenced, so we had to think about visa renewals stat! Technically, my visa started over when I flew back to the states to see my doctors in June, but Matt needed to renew his visa. 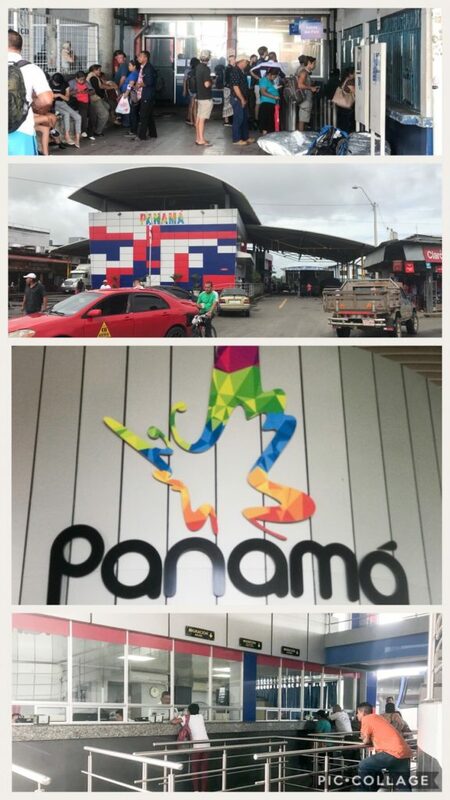 So, we decided we needed to make a road trip to Panama for an out of country small shopping trip. We rented a car from Economy which was a small pain in the a$$. We did a lot of research online only to be told completely different information upon picking up the car. You can rent the car for $6/day but the insurance required brings up the daily total to $60/day. And there is a 3-day minimum. 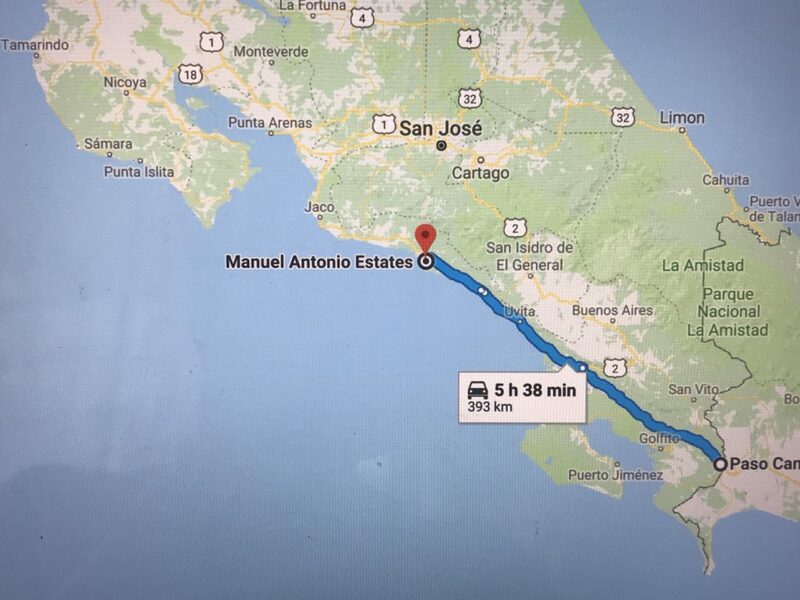 We got up early the next day, hopped in our little SUV and started our 3 hour journey to Panama (time: 0515). It was a relatively easy route, hop on hwy 34 to hwy 2 until it ends at the border. 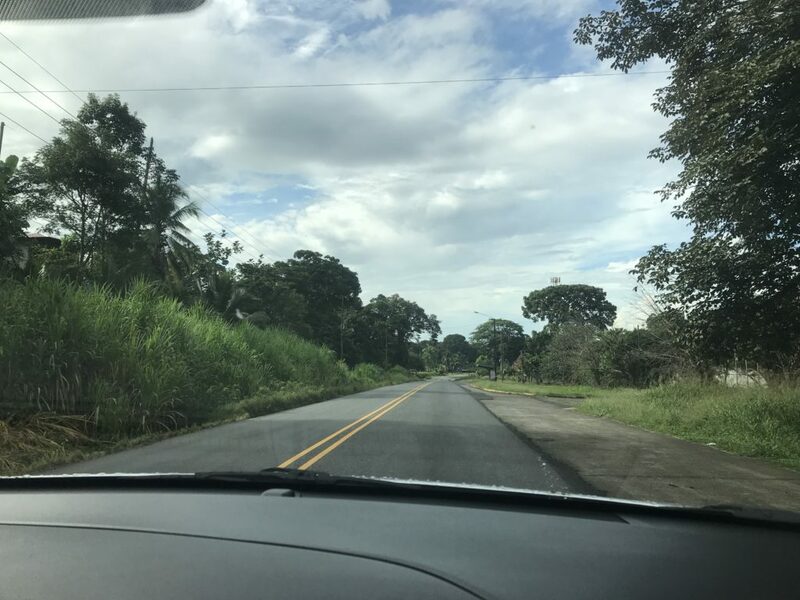 We traveled through beautiful country, palm tree farms, lush, green hills, and beautiful coastal villages. Average speed limit was 60-80 kilometers which is roughly 40-50 mph. Not very fast, but the roads are curvy with lots of twists and turns. In addition, you are dealing with motor bikes, bicycles, pedestrians, horse back riders, tractors, and 18-wheelers in your lane. Made for an interesting trip for sure. 0900. Upon arrival, we missed our designated secure parking lot. But, a very eager and aggressive parking attendant encouraged us to park on this corner with about 10 parking spots. He put a large construction barrel (cone) in front of our car – encouraging or scary? We paid him $10 to watch the car (the parking fee was $6). We later found the elusive secure parking lot. It had been blocked by charter buses and its sign was half falling down. Oh well. We are in the small border town of Paso Canoas in the Costa Rica. One of our local friends told us to pay our “exit fee” first, then go to clear out of the country. So, we searched for the little office across the street. Had we not known to do this step, we would have missed it for sure. This little window handled copies, public service, internet, and the exit tax. 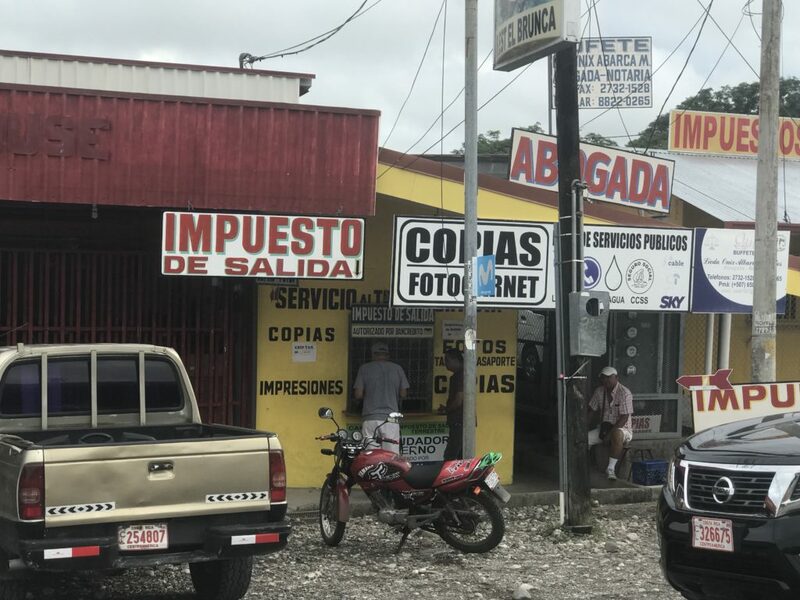 The “impuesta de salida” or “exit tax” is only $8/pp, but you have to pay it before going to immigration. Then you take your receipt across the street and head to the salida line. They were very efficient in processing people in and out. Once we cleared out of Costa Rica, we walked across the border to Panama. The Panama border was elaborate with a huge wall marking the entrance and exit into the country. 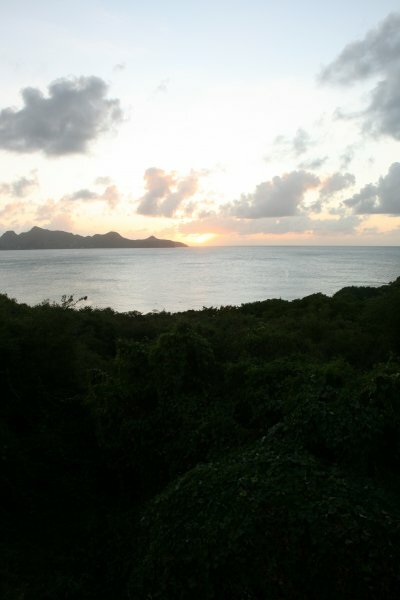 There were not many people there when we arrived so our visa process was relatively easy. I happened to look up at the clock and realized that Panama was an hour ahead of Costa Rica. So, we cleared in at 0945 which is important as we need to stay in Panama for 5 hours and we wanted to catch the World Cup games that started at 12. The only snag was with Matt’s passport. He has an “extended” passport with extra pages and a few countries skipped a few pages. So as you flip you have a dozen stamped pages, then a few blank ones, then a few more with stamps. The immigration officer did not like this and took a good 15 minutes to exam each page. After speaking to his manager, he took Matt’s fingerprints, asked his profession, and gave him a visa stamp. Luckily, for me, it only took 4 minutes to process my visa. Now, it was shopping time. 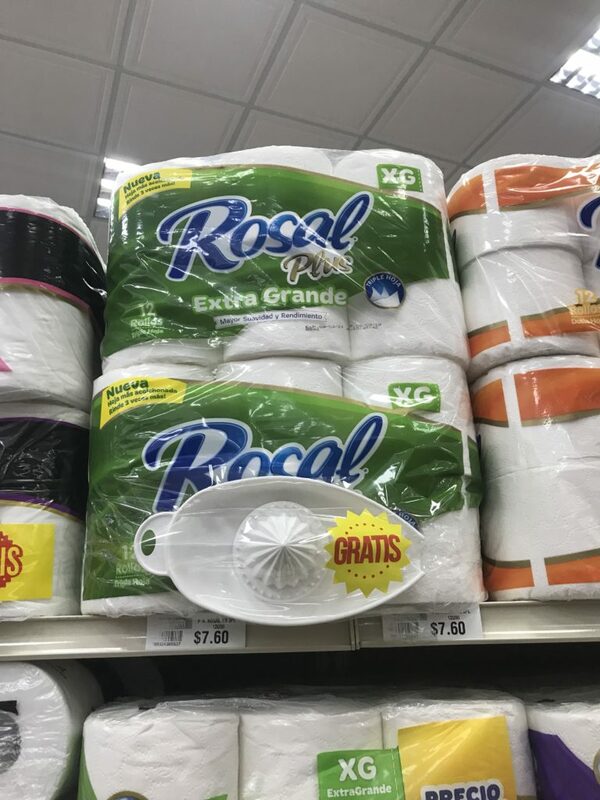 It is about a 50-60% savings when you purchase items in Panama vs Costa Rica. 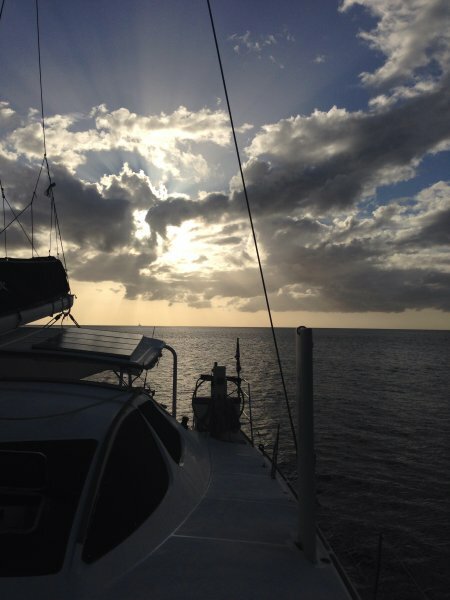 Unfortunately, we do not need a lot right now with the boat on the hard, but we can always find something. 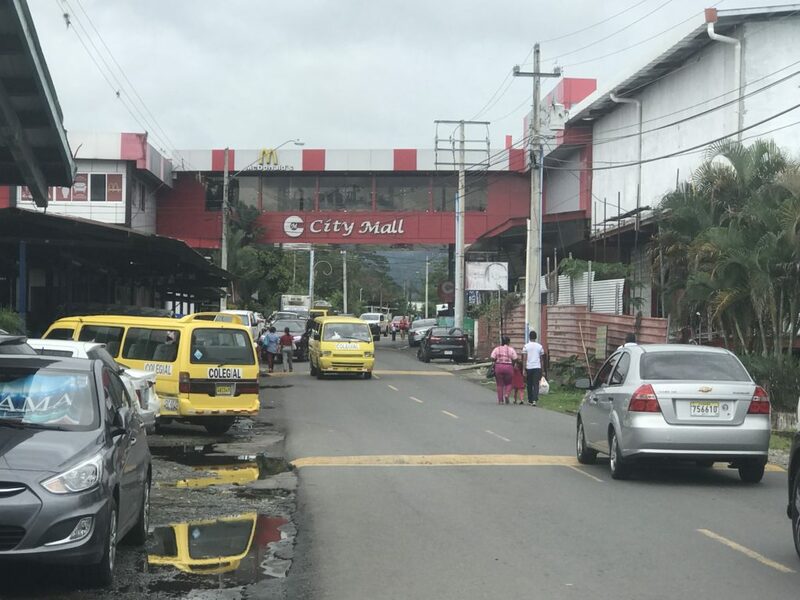 There are two malls on the border: Mall Jerusalem de Panama and City Mall. In addition, there are hundreds of small vendors along the way and on many side streets. We started at Mall Jerusalem de Panama as it was closest to the border entrance. It was basically a two-story building with a market, clothing, furniture, housewares, and hardware. A little bit of everything. We made notes of what we might want and their prices and set off to City Mall to compare prices. As we headed to City Mall, we realized we were uncertain as to what country we were in. Each building lies on the border, so you enter in on the Panama side and exit on the Costa Rica side. We were so confused one time, that we had to refer to the license plates on the cars to figure out what country we were in! We finally made it to City Mall and it was more of the same. A giant two-story building with a market, clothing, furniture, house wares, and hardware. We were getting hungry and figured it was close to game time, so we asked a tico where we could find a place to eat with a TV. She told us to go back to Costa Rica, down the street, to a place called Pizza Fabo. It was 12n, not a soul in the restaurant and a soap opera on the TV. Hmmm. After a lot of back and forth, we realized that the game started at 1300 in Costa Rica, so we sat down, ordered a pizza and waited. Good thing too as it as storming and we really did not want to walk around in the rain. Pizza was fabulous and Croatia beat England! Now, it was time to purchase our items. We stopped by a liquor store where we picked up (5) liters of Stoli for $10/ea and (5) bottles of Rose for $8/ea. Huge score considering the liter of Stoli is $30 in CR. We walked across the border, dropped the liquor off to the car and headed back to Panama. Next, we hit the market and stocked up on a few essential items. We loaded the car up again and headed back to the Panama Immigration station to clear out of Panama. Simple enough process, a lot of please and thank yous and we were done. 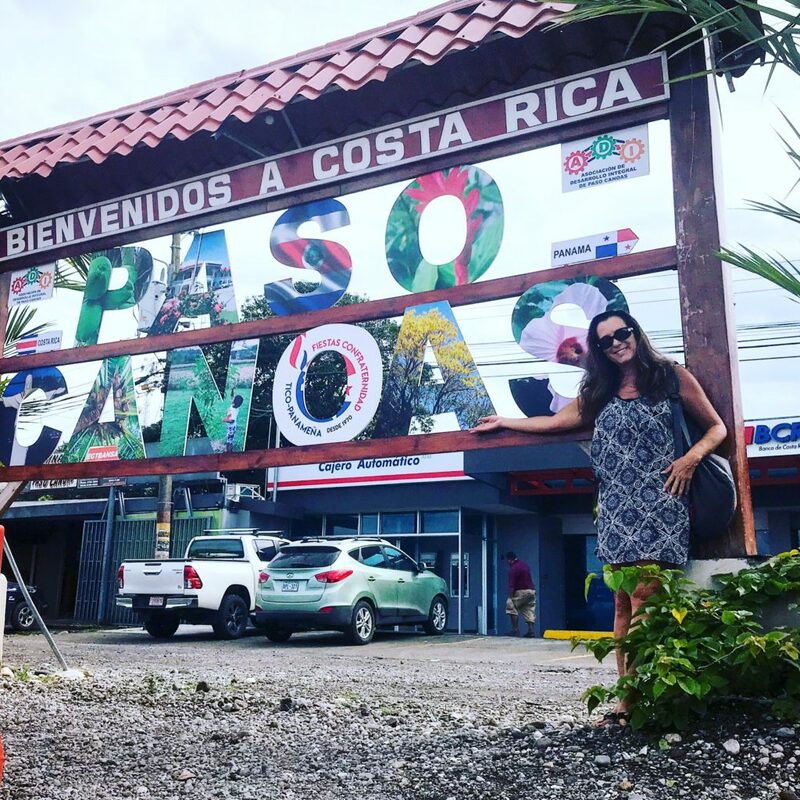 We walked back to the Costa Rica immigration station where they asked to see our return tickets back to the U.S. Luckily, we had anticipated this and purchased one way tickets from CR to MIA earlier in the morning. We showed our itinerary and she stamped each visa with another 90-days. Whew. Some countries, require you show proof of leaving their country (so you don’t stay indefinitely). 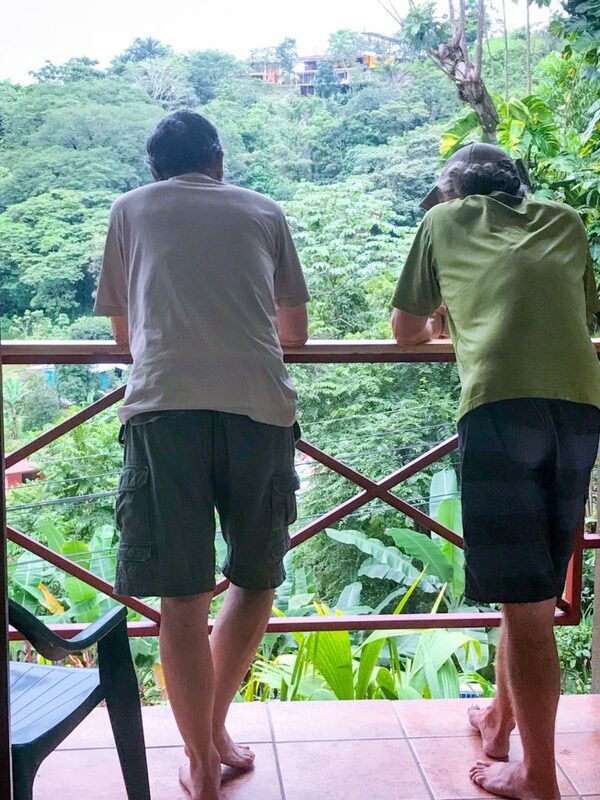 Armed with new 90-day visas, we headed back to the car to make our 3-hour drive back to Quepos. 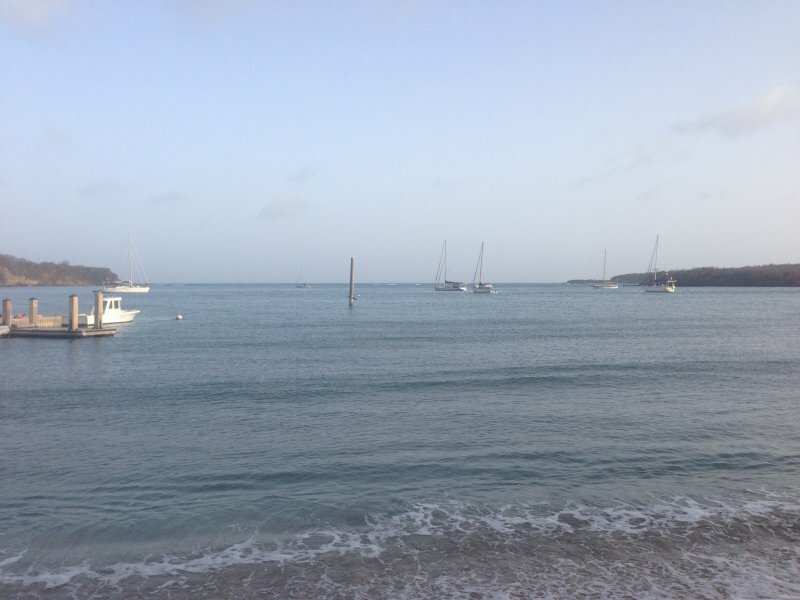 On our way back, we stopped in Domincal for a well deserved drink at beach bar during sunset. Tortilla Flats caught our eye, so we bellied up to the nearly empty bar. What a long day! But a successful adventure. Not sure why GoogleMaps shows it as over 5 hours, it was only a little over 3 hours. Of course, we may have bumped up our speed to 100 kilometers a few times (62 mph). 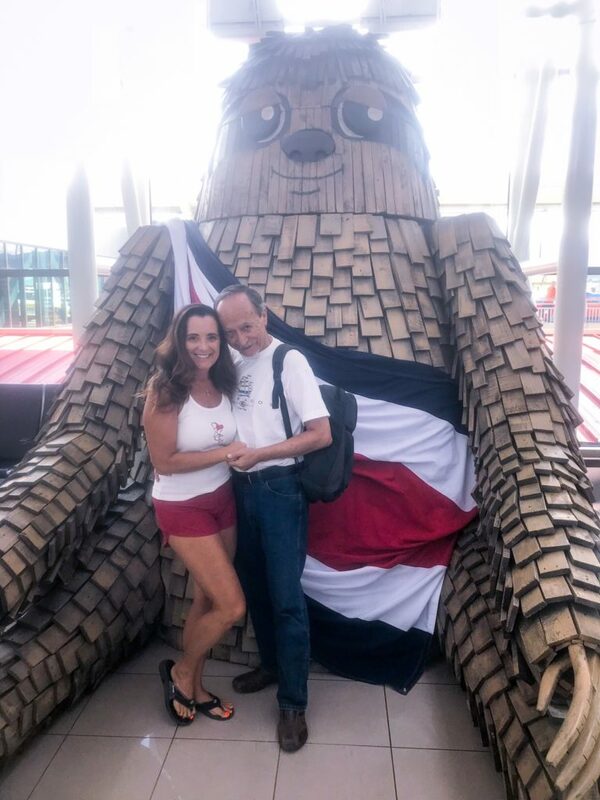 As most of you know, our blogs are several weeks, if not months behind “real time.” As it turns out, we will have to renew our visas a third time in early October. In foreign countries, you often find things that make you ask “why” like this pairing of a juicer with toilet paper. 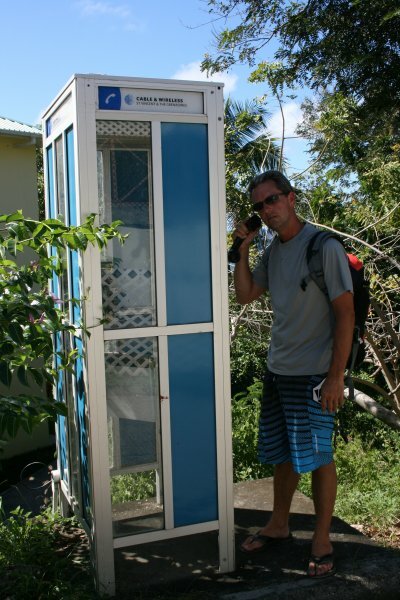 In case you are wondering what a “Tico” is – a local. 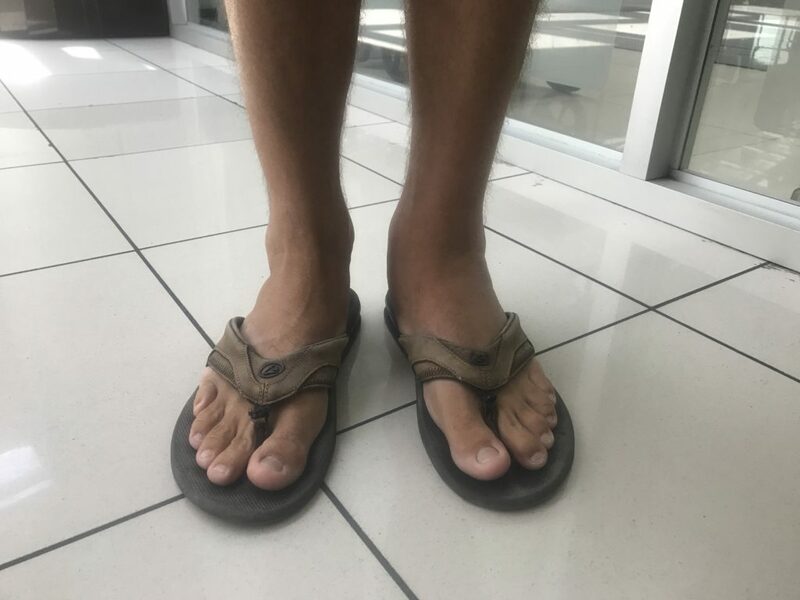 This entry was posted in Costa Rica, nonBoat and tagged city mall, costa rica, domincal, mall jerusalem, panama, paso canoas, pizza fabo, Quepos, tortilla flats, visa, visa renewal on September 25, 2018 by Christine. My dad came for a short visit and delivered a suitcase full of boat parts. 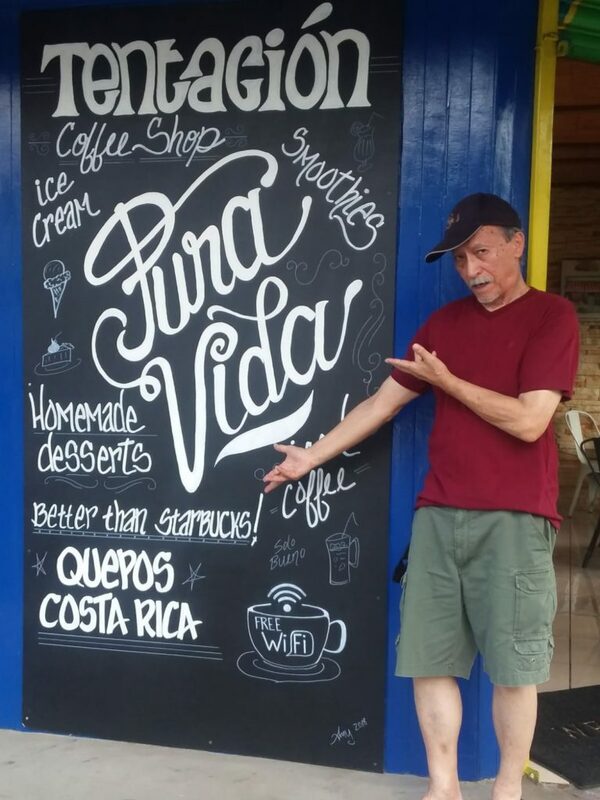 We were thrilled to host him in Costa Rica even though we were not staying on the boat. We decided to rent a car to pick him up at the San Jose airport (3 hours away) and to do some recognizance shopping. At some point before we “splash” we will need to provision the boat and stock up on staples so we wanted to find good “box stores”. In addition, we were looking for hardware stores (Ferraterias), car stores (PepBoys type places), and big box stores (Wallmart). We set a few pin marks on our trusty Maps.me app and drove the 3 hours to San Jose. We managed to find several stores, scoped out a few places to return to and made a few small purchases before my dad’s flight landed. Next, we did a drive by in Herradura to show him where Sugar Shack was anchored when she was struck by lightning. 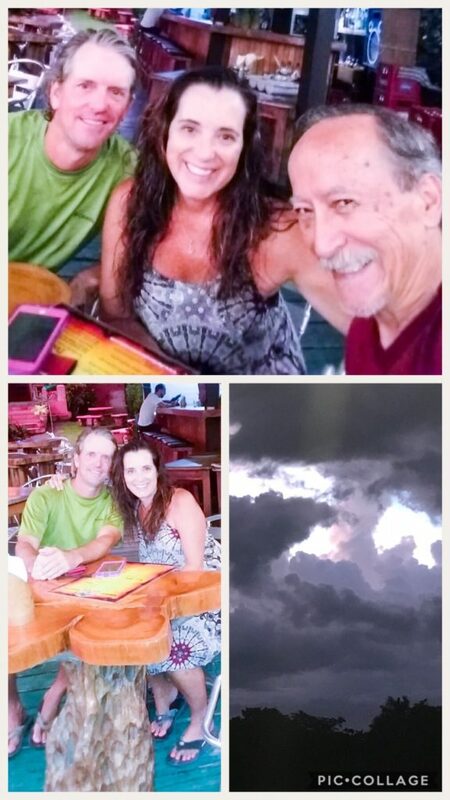 We caught a beautiful sunset at Jaco beach and stopped in for dinner at Ridiculous Burgers. My dad had an “all american burger” and Matt and I split a Mahi burger. Sound healthy? Well they did serve this ridiculous 6 patty burger shown below to a group of 4 people. We finally arrived back at the apartment around 2000 and started to unpack. My dad brought a suitcase full of boat parts, a gray backpack full of important stuff (money, passports), and a Swiss Gear new black backpack for all of his clothes. 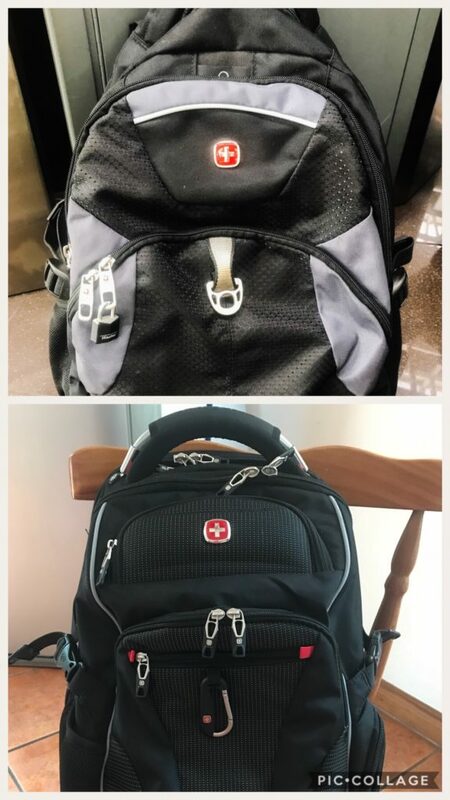 He opened the Swiss Gear backpack and realized it was not his. He thought it was ours which we quickly denied. Unfortunately, he had swapped backpacks with someone else. Yikes. See image below for photo of both backpacks. Inside this backpack was a Dell Computer with an “Asset tag” which identified the company. There was several resumes, a hard drive, thumb drives, glasses, medicine and miscellaneous items. We found her boarding pass, looked her up on LinkedIn and Facebook and sent messages through both social channels. There was no other contact information. We scored some new outfits, met Matt for lunch, walked to the marina and then walked back to the apartment. My dad is not a big walker and he was shocked to realize he had put in 3.2 miles of walking. Yeah dad! Dad wanted to check out a local fishing village and fishing processing plant. Barrio el Cocal is “the” place to go to see the local fisherman. We swung by a plant that let us look around, watch them cut and clean their fish, and put the heads in storage – all really gross, but dad loved it. 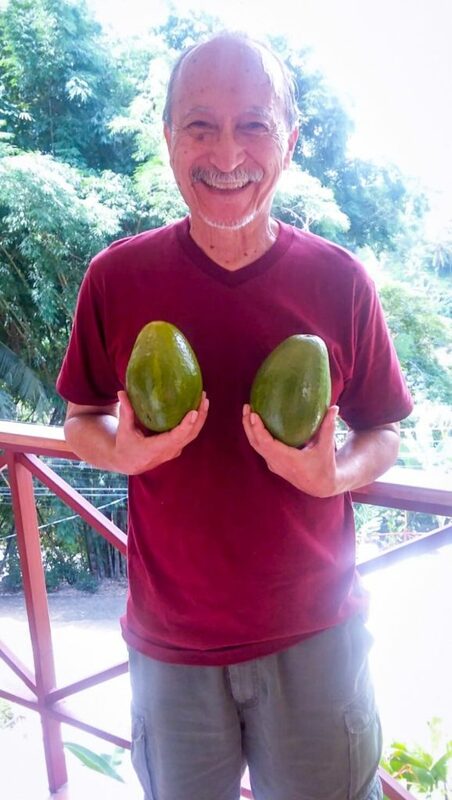 Came across a local avocado seller and dad was surprised at the size of the local avocados – these are not your average California avocados. 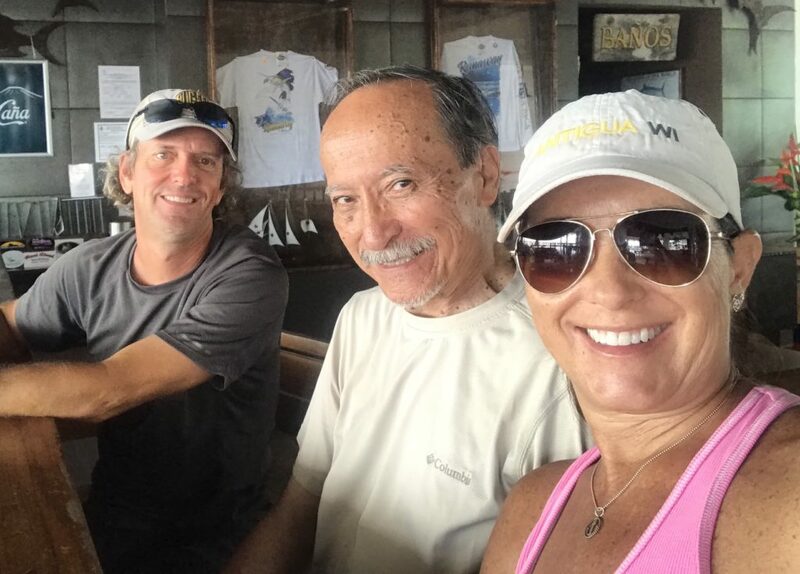 We stopped at Bahia Azul for a cold drink and Tiquicia for lunch before heading back to the pad. After thoroughly exhausting him, we headed back to the apartment for a little R&R before going out for dinner. Much to our surprise, it has not rained in the first 3 days of my dad’s visit. Super strange, as it it normally rains every day for many hours a day. But we finally received some rain in the afternoon for a couple of hours. Being from California, he had not seen rain in a very long time. In fact, now he is mostly seeing smoke and ash in the sky from the horrible California wildfires – so rain is a pleasant surprise. 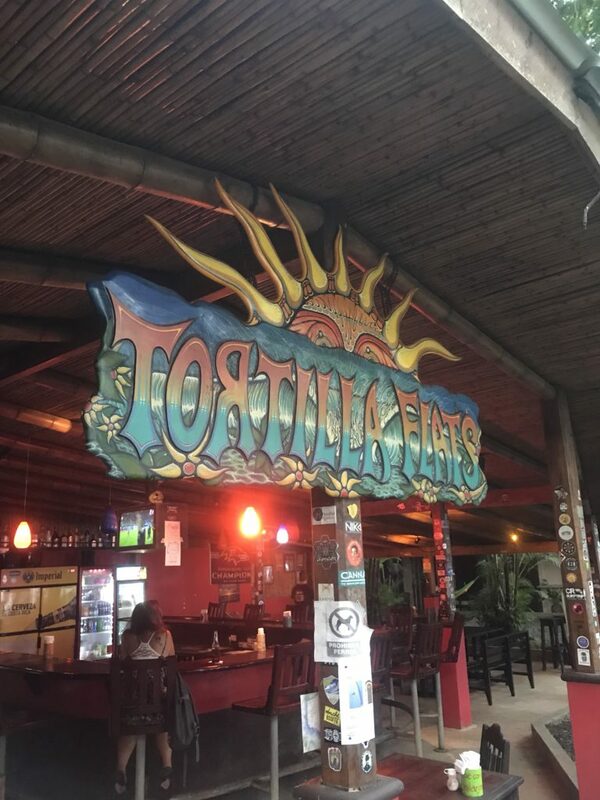 We hopped on the public bus and headed to Manuel Antonio for happy hour. 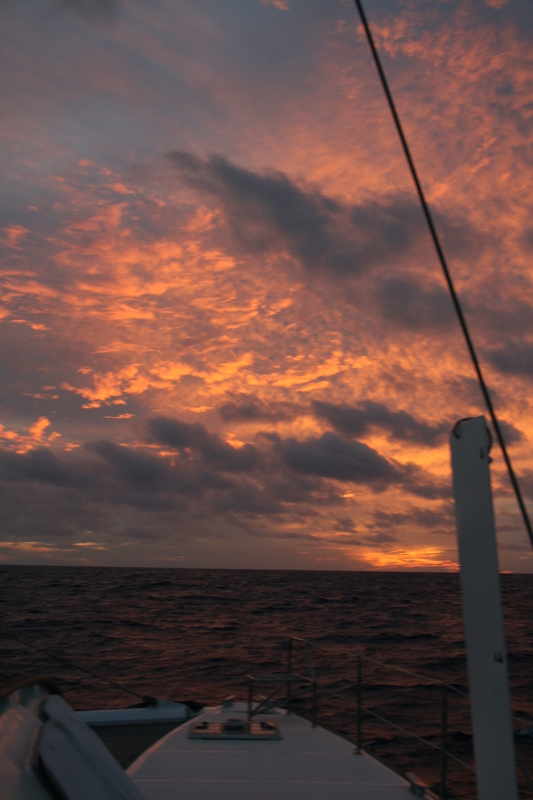 We were treated to an awesome lightning show (it is only awesome because we were on shore and not on our boat). Cold drinks overlooking the Pacific at Bar Code 506. Time to show dad the boat. 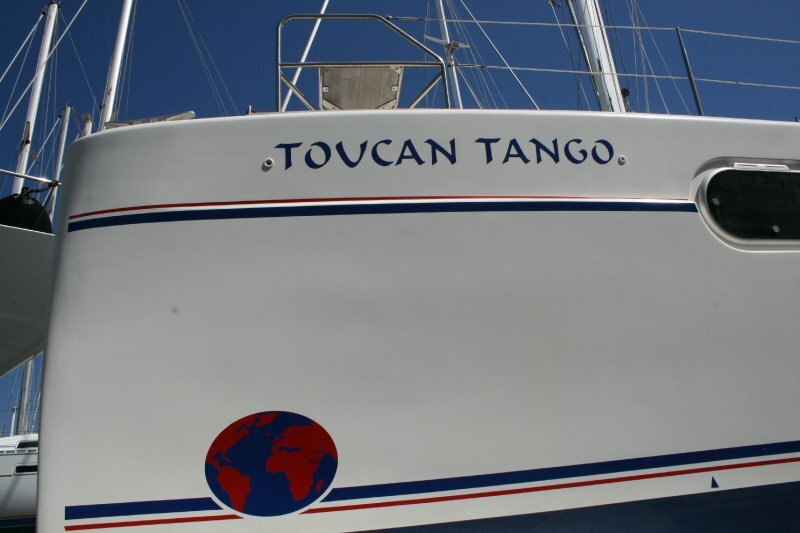 We swung by the marina a few days ago, but we were not able to show him the interior of the boat because we had workers all over the place. 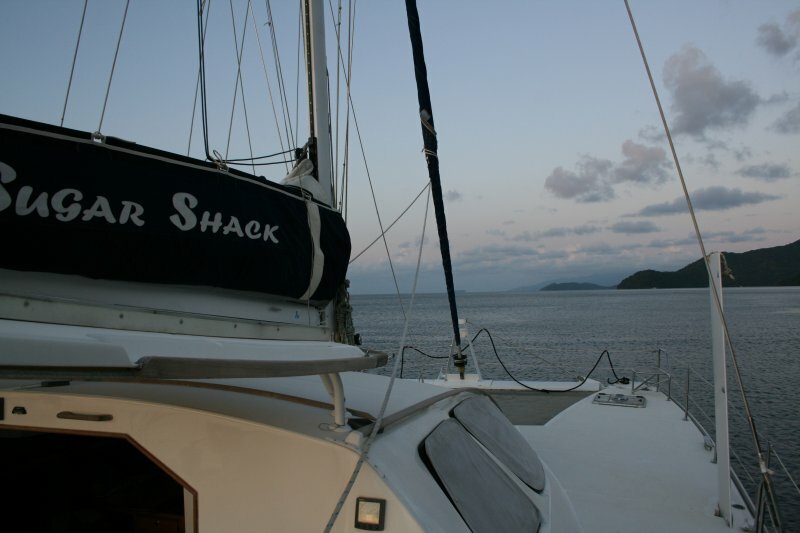 First, we took him to see RumpleTeazer, our friend Keith’s boat which is a 43′ Catana. 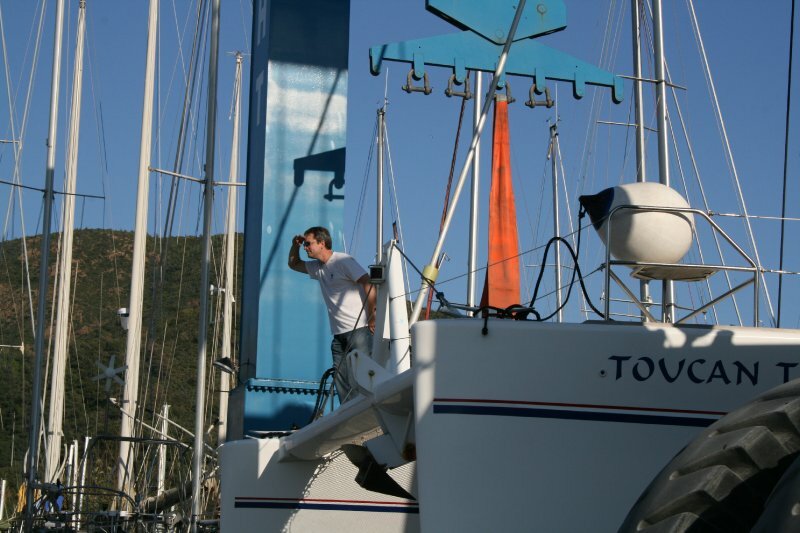 I wanted him to see what a “livable” boat looked like before we took him to see our boat which is all torn apart. Keith was super kind and let us poke all around. 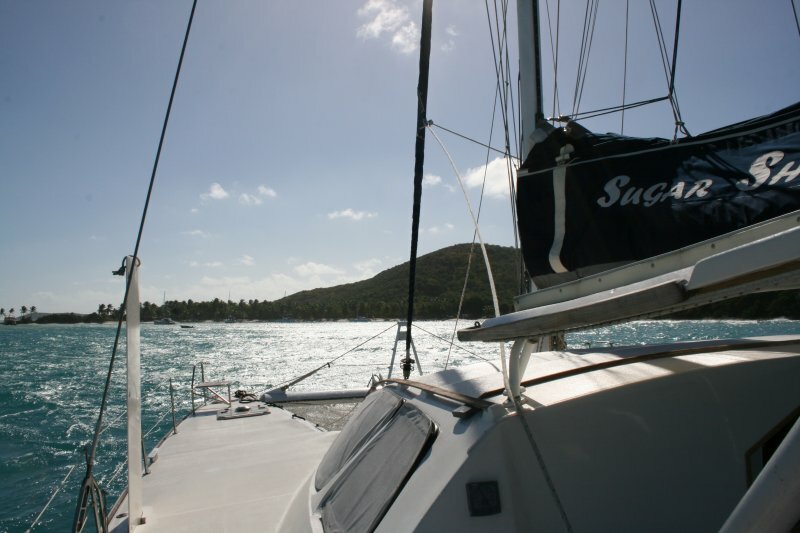 We then walked over to the yard to show him Sugar Shack and to his surprise he really could tell the difference between a 43′ and a 47′ catamaran. Even though it is only 4′ shorter and maybe 2-3′ skinnier, the spaces feel bigger. I didn’t get the idea he was very impressed with our boat but who could blame him as it was a total disaster. We had another casada at Soda Sanchez, our go to spot for spectacular food. As you might recall, a “Soda” is not a drink but a local eatery. Sometimes they appear as businesses, sometimes they are on the front porch of someone’s house. A “casada” is a typical local meal that comes with a salad, veggie, beans, plantain and your choice of either meat, chicken, fish, or pork. All for the low price of 2,500 colones or $5.00. Tasty and cheap! And, to my dad’s surprise, he walked another 3.3 miles today! I will get him walking and drinking water if it kills me! It was hard to send him off after such a short visit, but hopefully we have convinced him to come back once the boat is back in the water. 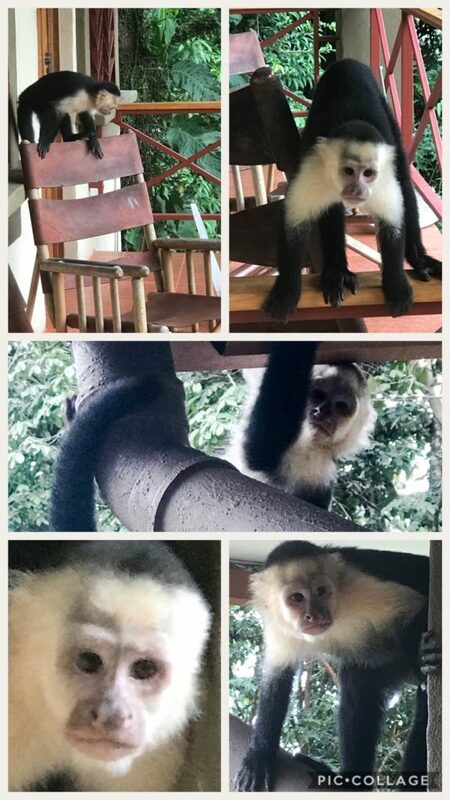 We got a little Capuchin love on dad’s last night at the apartment. Short and sweet. We rented a car to return dad back to San Jose and pick up Wayne. We went straight to Alaska Airlines to swap bags. It doesn’t look like they are 100% similar because the lighting was different, but they both were black. Not sure who grabbed whose bag first, but at least they are both back with the rightful owners. 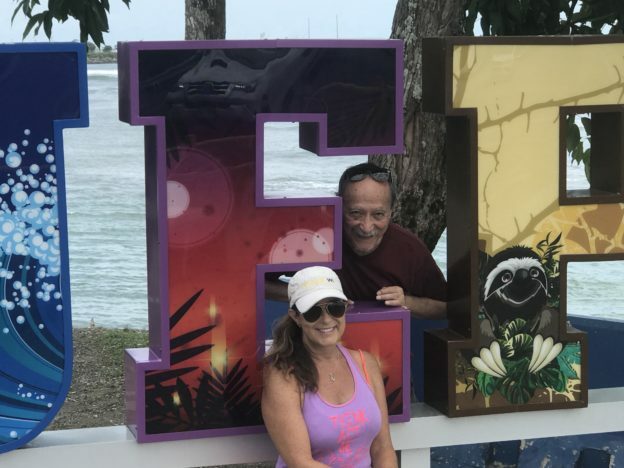 This entry was posted in Costa Rica, nonBoat and tagged bahia azul, Bahia Herradura, barcode 506, capuchin monkey, dad, jaco, manuel antonio, manuel antonio estates, Quepos, ridiculous burgers, rumpleteazer, runway grill, soda sanchez, tiquicia on September 18, 2018 by Christine.